I received an email from Molly from Teza technologies where they usually celebrate the “International day of the girl” across the globe. When she contacted me, I did not hesitate to agree talking about this on my blog as it is a subject close to my heart especially as a Nigerian woman. This day of the girl not only highlights opportunities for girls, but celebrates every girl and their achievements. Over47% of the work force are women and hey! We all need to be celebrated! At Teza the celebration of women is important and so this should be done on a daily basis. We have to celebrate the women whom are already making a difference and show why women in STEM(science, technology, engineering and math) is important. There are currently 19 nations whose high school students are performing better in science than those within the United States and 36 percent of students that declare a major within the Science, Technology, Engineering, and Math fields do not obtain a degree within these fields. Misha Malyshev, CEO of Teza Technologies works with nonprofits to curb that number. International Day of the Girl is a great time to celebrate the women in this field, and every field, and recognize the opportunities allowed to girls. The image below shows what I am talking about. As a Nigerian woman, this movement is something I would like to see happen in my country. Women in my country go through a lot and get back little respect most times. We are hardly ever celebrated even with the positive difference we make. The day of the girl is a movement, I think will help us as Nigerian women to soar and grow; not only intellectually, but mentally. Not only do I think we need to celebrate each other more often as women, the Nigerian government and everyone in power needs open doors for it’s women to flourish. Forget about everything else right now and focus on celebrating yourselves as women! If we must copy oyinbo thing, let this be it! And back to the recipe. I decided to do this recipe on the day I created a shrimp filling for devilled eggs. The filling was absolutely delicious and with my ajebutters expecting breakfast; akara to be precise, I made this. 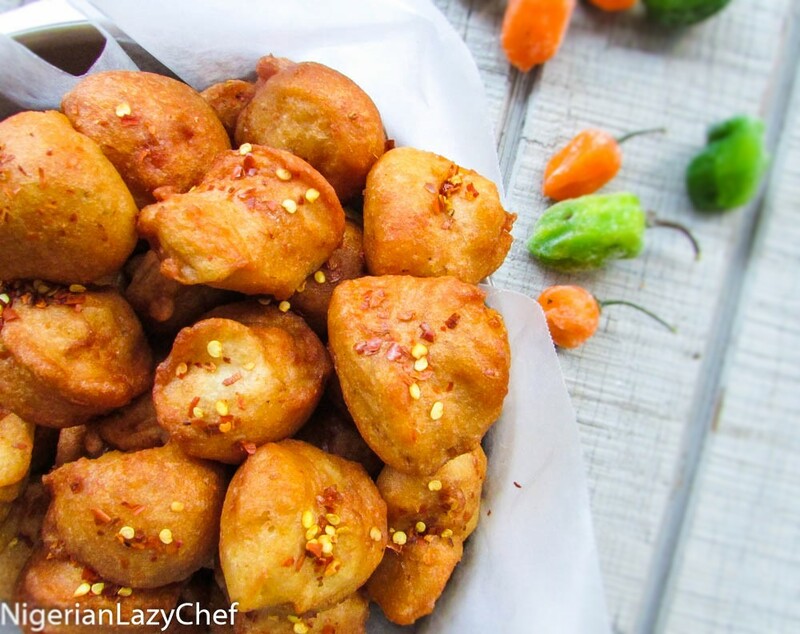 Well, before making the akara, I was confused as to how I would cook the shrimp with it until I talked to fellow blogger Runy of thecuilinaryjunkee and she suggested that I should cook the shrimp half way before frying it with the bean batter. Cooking the shrimp half way enabled the shrimp from being over cooked and rubbery. This entry was posted in Akara, Appetizers, Bean recipes, Beans, Breakfast, Breakfast ideas, Gluten free recipes, Local dishes, Lunch, Lunch ideas, main dishes, main meals, Nigerian Street Foods, Street food, Street Snack, Uncategorized and tagged akara recipe, Akara shrimp and akara recipe, Atadindin, bean fritter, bean fritters, Nigerian breakfast, Nigerian food blog, Nigerian street food, pepper sauce, recipe. yumssssss! I musto make this echi niile Nma! love ur awesome foodie self….and sum. lol!